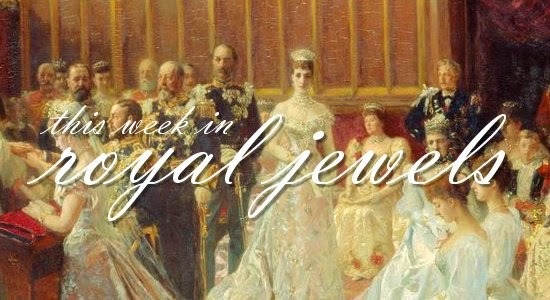 From fashion galas in New York to government business in London, we've got a range of royal jewels for you to marvel at this week. Be sure to vote for your favorites in the poll below! 10. 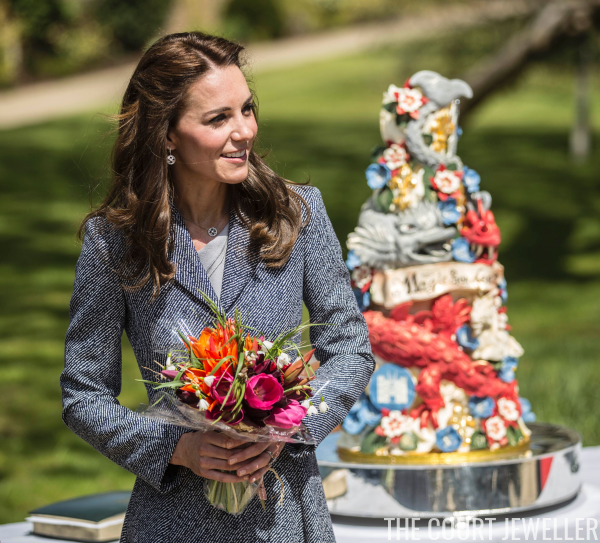 The Duchess of Cambridge wore pieces from Mappin and Webb's Empress collection for a visit to the Magic Garden at Hampton Court Palace on Wednesday. 9. 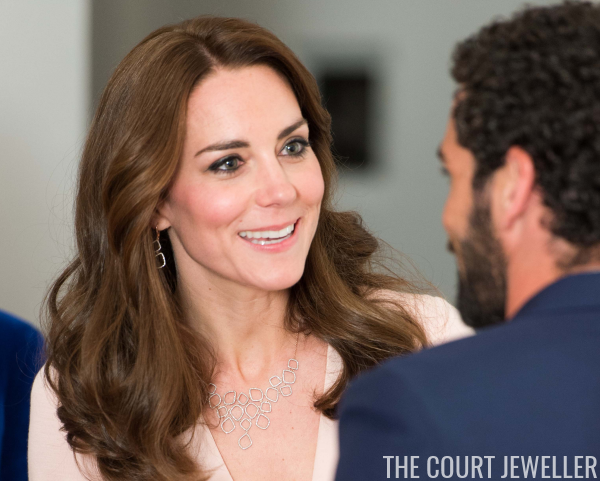 On Wednesday, Kate also wore jewels from Monica Vinader's Riva collection to visit the Vogue exhibition at the National Portrait Gallery -- only days after we all discussed whether or not the set had been loaned. 8. 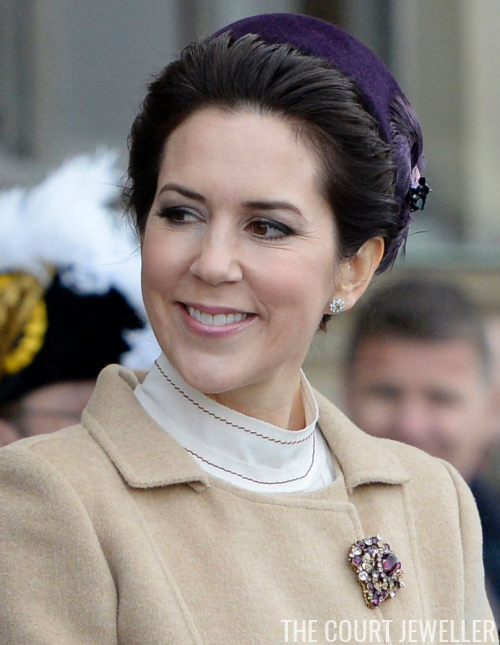 Crown Princess Mary of Denmark helped to celebrate the Swedish king's 70th birthday on Saturday while wearing this lovely brooch, which appears to be set with amethysts. 7. Queen Rania of Jordan glittered in a pair of chandelier earrings at the Met Gala on Monday evening. You can see many more pieces of sparkling jewelry from the gala over here! 6. 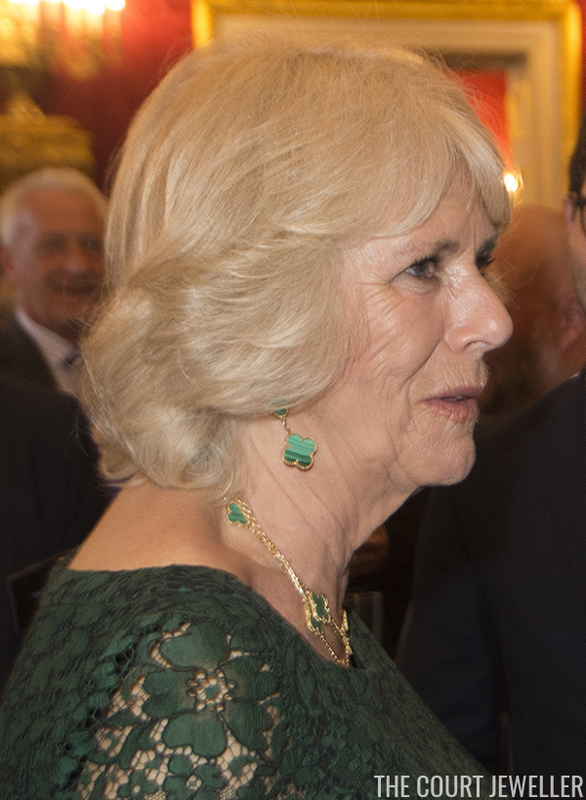 The Duchess of Cornwall debuted new malachite and gold pieces from her Van Cleef and Arpels Magic Alhambra collection at a reception for British Oscar winners on Wednesday. 5. At the Liberation Day Concert in Amsterdam on Thursday, Queen Maxima wore diamonds on both wrists: her wedding bracelet and her family's initial bracelet on her right wrist, and one of the East Indies bracelets on her left. 4. 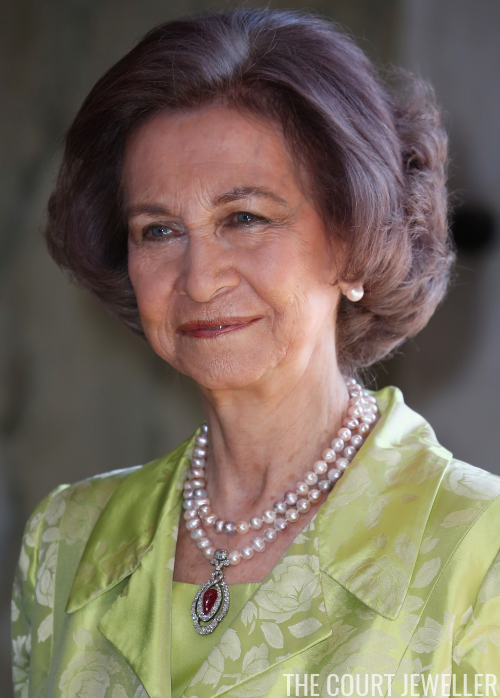 For the daytime celebrations of King Carl XVI Gustaf of Sweden's 70th birthday on Saturday, Queen Sofia of Spain wore a pearl necklace with her mother's diamond and ruby pendant. 3. Queen Letizia of Spain wore a dramatic pair of long fringe earrings on Thursday for a journalism awards ceremony in Madrid. 2. 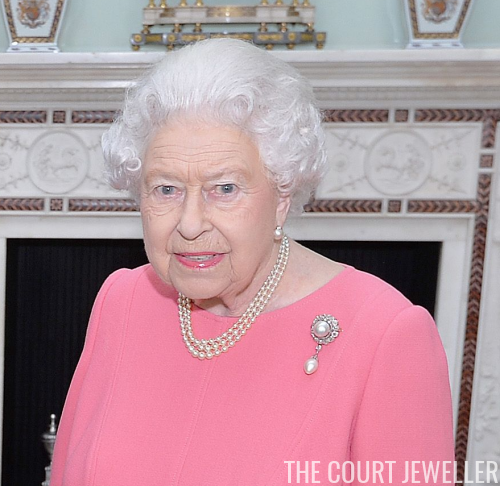 In London, Queen Elizabeth II wore the Cambridge Pearl Pendant Brooch for a meeting with Japan's prime minster on Thursday. 1. 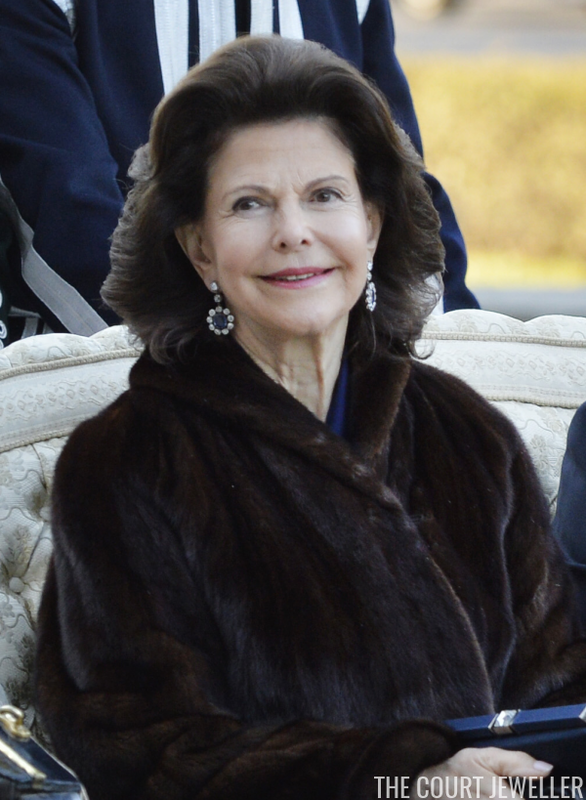 Queen Silvia of Sweden wore major Bernadotte heirlooms, the earrings from the Leuchtenberg Sapphire Parure, at the concert held the night before her husband's birthday.